Cobblestone streets, live oaks draped with Spanish moss and the slow pace of a historic Southern city serve as inspiration for Savannah, Georgia, painter, historian and writer Preston Russell, M.D. He lives in a house that was built in 1860 and uses its adjacent carriage house as an art studio to create his acrylic paintings that portray the beauty of the city he calls home. This is where he has spent most of his time since retiring from medical practice in 2000. Russell began to dabble in painting in the 1960s. His father wanted him to be a physician, so he began medical school at the University of Tennessee Health Science Center in Memphis before transferring to Vanderbilt University School of Medicine after his second year. He earned his medical degree in 1966 and stayed at Vanderbilt for his residency in pathology before moving to Savannah in 1973 to set up his practice at Memorial University Medical Center. “After my retirement I have pretty much pursued my painting and art,” he said in a slow, Southern drawl. Russell has published three books, all historical non-fiction, and is working on a fourth. Among his works are “Savannah: A History of Her People Since 1733” and “Lights of Madness—In Search of Joan of Arc,” which he worked on for 10 years. When he reflects on his years in Nashville and VUSM, two words come to mind: hard work. Those years are a distant memory now, and Russell is free to pursue his true passion. 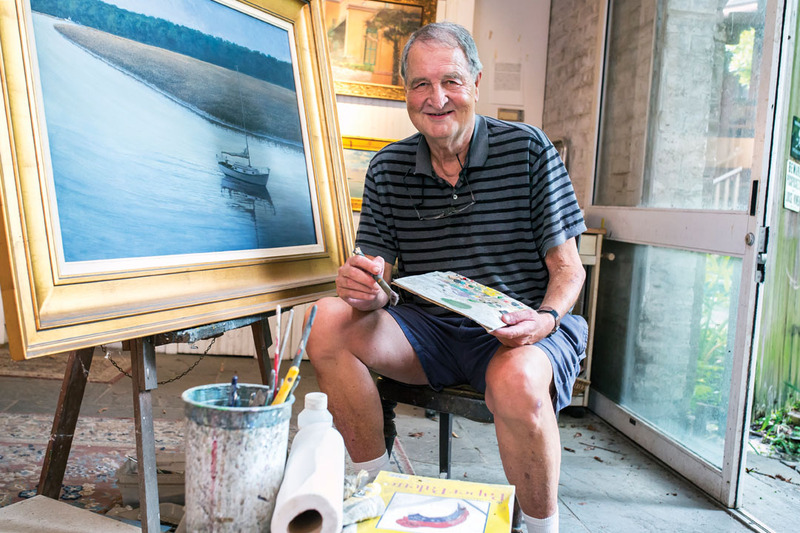 “Between Savannah, which is beautiful, and Charleston, which is beautiful, your mouth waters with wanting to paint rare scenes, buildings and street scenes,” he said.